It's New Year's Day 2015, which means that Google searches for the 2015 horoscope are going to be one of the most popular on search engines this and in the next few days. It is somewhat surprising that searches for the 2015 horoscope will make up such a large part of search engine volume (they always have in the past) considering that the age of science as we know it began over 400 years ago. So, what is astrology and why do people believe it? 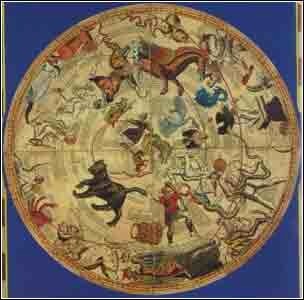 Astrology is the ancient belief that the stars and planets shape one's personality and fate. The ancients believed that the zodiac constellations (the ones through which the Sun passes) hold special powers that can shape personality. Also, it was believed that any given constellation was at its most influential when the Sun was present within its boundaries. As the final astrological commandment, the planets themselves have special traits that they can pass on to individuals. Take these three tenants, combine them with the logical fallacy of post hoc ergo propter hoc (false causal relation) and one gets astrology, the long since debunked belief that planets, stars, and the Sun can impact the fate of humans. So why do people continue to believe such nonsense? The theories are many. One belief is that humans like to be part of something bigger than themselves. That's why we have families and join social clubs, we want to belong. Taken to the extreme, some people like the idea that their personal fates are tied to the celestial realm, which seems like the ultimate way to belong to something. Unfortunately, these people are wrong when it comes to the heavens impacting their lives. However, on a much more basic, wondrous level, we are all part of the cosmos in that every atom in our bodies was formed either in the Big Bang or in the cores of stars. Another (false) idea is that astrology provides answers as to why things happen. Put it this way, some people would rather believe that a bad alignment of, perhaps, Mars and Venus is the reason that he/she had a blowup with a significant other. To put it bluntly, some people just hate taking responsibility for things and the heavens can provide an easy scapegoat for life's misfortunes. A third idea of why people believe in astrology is because those daily astrology columns really serve as an advice column. Want proof? Find and a horoscope. If you read the message closely, you'll see that the predictions aren't predictions at all, but merely suggestions, and rather vague ones at that. For some people though, any advice is good advice. Personally, if you must have advice from strangers, stick to your local Dear Abby-esque column. A final reason that people believe in astrology is that old habits simply die hard. So, back to the new year. 2015 is here and, if you're looking for a new year's resolution but just can't seem to settle on one, why not make it a point to kick irrational beliefs like astrology to the curb? Oh, and while you're at it, be sure to toss those lucky shirts, magic charms, and any other object that has potential to harm sound judgment out the door, too.